Visitors to this park truly stand above the rest, because it includes the highest mountain in the state at 1,772 feet above sea level. An overlook provides views of other nearby peaks in this ancient granite range of the St. Francois Mountains. However, the principal attraction of this park is for those who want to enjoy wilderness hiking in a spectacular scenic setting. The park contains 7,448 acres of Missouri’s most primitive backcountry. A short walk from the parking lot leads to the highest point. A three mile hiking loop leads to the state’s tallest waterfall, Mina Sauk Falls, where waters cascade 132 feet down a series of rocky volcanic ledges. 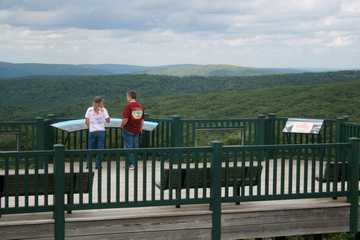 The Ozark Trail, the state’s longest hiking route, branches from the loop trail at the falls. One mile below the falls, it encounters the Devil’s Tollgate with its eight-foot-wide breach in a massive granite outcrop, which was a major impediment on an old wagon road. All along these trails, ancient granite glades and balds create openings in the forest cover that support a biodiverse community of flora and fauna. 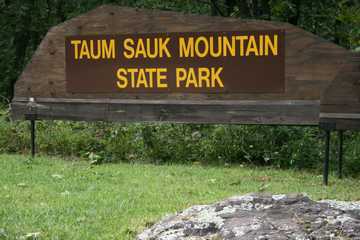 This part of the park is included in the 7,028-acre St. Francois Mountains Natural Area, the state’s largest.